We have been discussing the working principles and Air-Standard cycles of different types of Internal combustion Engines in the previous articles. But in this article, we are going to discuss the significance of the Important qualities of the Compression-Ignition engine Fuels. In Compression-Ignition Engine, fuels should possess certain qualities to run the engines smoothly and should give the best performance. The Important qualities of Compression-Ignition Engines Fuels are discussed in this section. The fuel should be sufficiently volatile for the operating range temperature to produce mixing and combustion. Diesel is one of the fuels which is having sufficient volatility for the compression Ignition engines. We can measure the Volatility of any fuel by the distillation process at the atmospheric pressure and in the presence of its own vapour. The method for measuring this Volatility of the fuel has been standardised by the American Society for Testing Materials (ASTM). Following is the distillation curve for the Diesel. The Compression Ignition Engine fuel should be helpful in starting of the engine easily. This requirement demands a high enough volatility to form a combustible mixture readily and a high Cetane rating in order that the self-ignition temperature is low. Knocking is a sharp sound caused by premature combustion part of the compressed air and fuel in the cylinder. The knock in the CI engines occurs because of an ignition lag in the combustion of the fuel between the time of fuel injection and the time of actual burning. A good CI engine fuel should have the very less ignition lag. so that the fuel will ignite more readily. The ignition lag also effects in the starting and warm-up of the engine. This can be measured in the cetane rating. The high cetane rating fuel will result in less knocking in the CI engines. The best CI engine fuel should not promote any smoke or odour in the engine exhaust. The volatility is the first prerequisite to ensure good mixing and therefore complete combustion. CI engine fuels should be able to flow through the fuel system and the strainers under the lowest operating temperatures to which the engine is subjected to. The fuel should not cause corrosion and wear of the engine components before or after combustion. These requirements are directly related to the presence of sulphur, ash and residue in the fuel. The fuel should be a liquid that will readily flow under all conditions that are encountered in actual use. This requirement is measured by the pour point and the viscosity of the fuel. the fuel should also have a high flash point and a high fire point. These are the different important qualities for Compression-Ignition Engine Fuels. 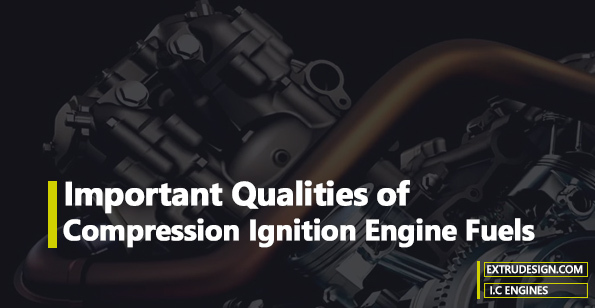 As we discussed the important qualities for Compression-Ignition Engine fuels, such as the Volatility, knock characteristics, viscosity, smoking and odour lead us to the best performance of the Compression-Ignition Engine. If you have any thoughts on this topic, Please let us know in the comment section below.